Could you believe that? This time you are going to bounce this strange ball and hit the target. Do you think that it is so easy? Well, well then just try it and you will love it! There is no time to explain! You must do it right now! It's really amazing! Here you must complete a series of tasks in this super bouncy quest, throwing and making balls bounce towards the circle they must pass through and more than simply simulating a basketball shot from afar, use the given platforms to help increasing score and give each ball new properties, such as bouncing on one another to double a single try's punctuation. Conquer every and each goal of the trial levels using the mouse within the marked area, counting with the hinting support of the aim itself. Is everything clear? So, just use all tips and good luck to you! 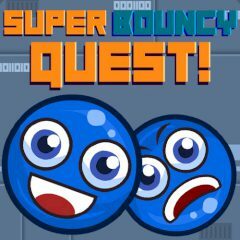 Games Similar Super Bouncy Quest!